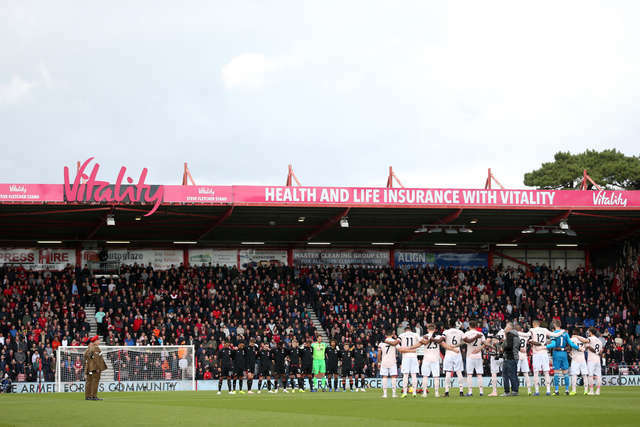 AFC Bournemouth struck first but were pegged back and then cruelly denied a point at the death by Manchester United, who won 2-1 at Vitality Stadium. 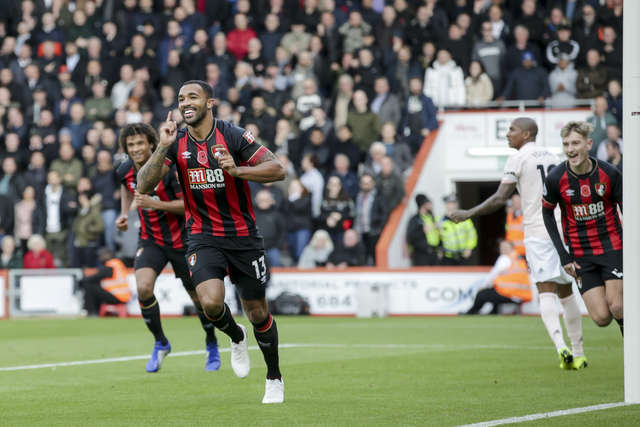 A truly electric start from the home side saw Callum Wilson continue his fine recent scoring run when he buried a cross from the right for his 50th Cherries goal. The brilliant beginning came to a halt though as United had parity when Anthony Martial levelled before the break. Ashley Young hit the crossbar with a well-taken free-kick in a frenetic second half as the Red Devils were much improved, and both sides had chances to win an enthralling encounter before Cherries hearts were broken by Marcus Rashford in injury time, the England man scrambling home from close range. Eddie Howe made one change to his line up from the previous weekend, Junior Stanislas coming into the side for his first Premier League start of the season, the game soon getting under way after a silence to commemorate Remembrance Day and the tragic events following the match at the King Power Stadium last Saturday. The lunchtime silence soon became roars from the home fans when Ryan Fraser had a golden chance four minutes in. Wilson's pass saw Chris Smalling commit himself, the Cherries winger taking advantage to speed through, taking aim but seeing his shot saved by the legs of David de Gea. A spellbinding cross in from Fraser dropped over heads and for Wilson to prod the high-bouncing ball into De Gea's midriff, and moments later Adam Smith broke through to square for Stanislas, his shot deflecting narrowly wide. The pressure became a goal in the next attack, the Cherries' fourth major chance leading to their well-earned opener. Stanislas was the architect as he found space on the right and delivered a delicious low pass that Wilson strode onto to bury into the bottom corner, his fourth goal in four league games. The pace continued from the hosts, Smith bewildering the United defence with a bouncing cross that only narrowly missed going in at the far post, before, in their latest opening on 22 minutes, Stanislas shot from 23 yards with De Gea able to save. It took the away side over 30 minutes to have their first attack of note, Martial laying back for Fred and the Brazilian striking at Nathan Ake when he should have scored - and United soon did level ten minutes ahead of the break. United's attacking prowess was shown when Young and Alexis Sanchez combined down the right and the low ball into the box was turned home clinically by Martial. The equaliser swung the pendulum in United's favour, Juan Mata dragging a chance wide after cutting inside, though Bournemouth were again quick to counter, Fraser's near-post shot pushed wide by De Gea. The breakneck first half came to a close, the second opening in a more even manner until David Brooks' deft back heel was well saved by De Gea. However, United were beginning to carve out chances, Asmir Begovic required to save well twice to thwart Luke Shaw and minutes later Sanchez as the visiting pressure grew. In an amazing few moments Young curled a free-kick onto the crossbar, the rebound dropping to Martial whose effort was remarkably blocked by Ake, substitute Rashford seeming certain to convert the third chance only for Brooks to retreat and clear off the line. Ander Herrera went within a whisker with a shot from the edge of the area, Howe then replacing Lewis Cook with Dan Gosling to stem United's flow. Inside the final ten minutes, a terrific passage of one-touch attacking play from the Cherries resulted in Brooks in the box with freedom to shoot, but not catching his left-footed effort perfectly De Gea was able to parry. Begovic saved well down low from Lingard, but as the last of the four added minutes ebbed away, Rashford controlled a looping centre and bundled home a winner to silence the home fans and steal away a point that had been within touching distance. The Cherries' start at Vitality Stadium will likely long be spoken about. United were pinned back in the opening moments, wave after wave of attacks creating a match-worth of chances inside half an hour against a team of the visitors' standing. 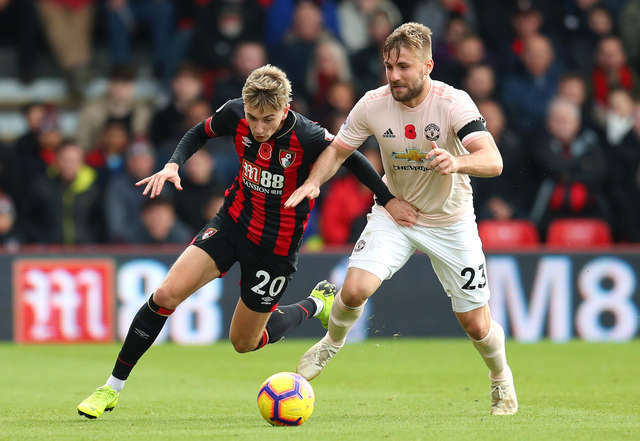 The dazzling out-of-the-traps effort from the Cherries was unable stun United however, and as the away side gave their late-half response a nervousness came into Bournemouth's play and they were unable to finish the period with a lead they had worked so hard to earn. Short of Joshua King, Wilson has been even more invaluable than ever in the last two games. The front man's fine form sees him hit seven goals already, but his game has become much more than just finishing off attacks. Key to the Cherries' forward thinking has been not just Wilson's running but his ability to use his strength to retain possession, allowing time for Fraser, Brooks and Stanislas buzzing around him to provide their support in numbers. The frontman also bagged his 50th Cherries strike, a great achievement after his two knee injuries.